Sunday June 9 1907 It began raining early this morning and jist poured down till eleven oclock. I was jist worn out will the work of the past few days. I got up dinner for Will and I did a little writing in afternoon. got the supper over early. There was a hard rain early in evening. Monday June 20 1907 It rained very hard in the forenoon again. Will went to town in afternoon Billy busy about the place. There was a frightful wind in afternoon. I was busy with chickens Tuesday June 11 1907 Billy helped me do a big washing. Ralph finished the paining today. I went down to The Armory at 5.37 and came back at 5.20. Did ironing in evening. 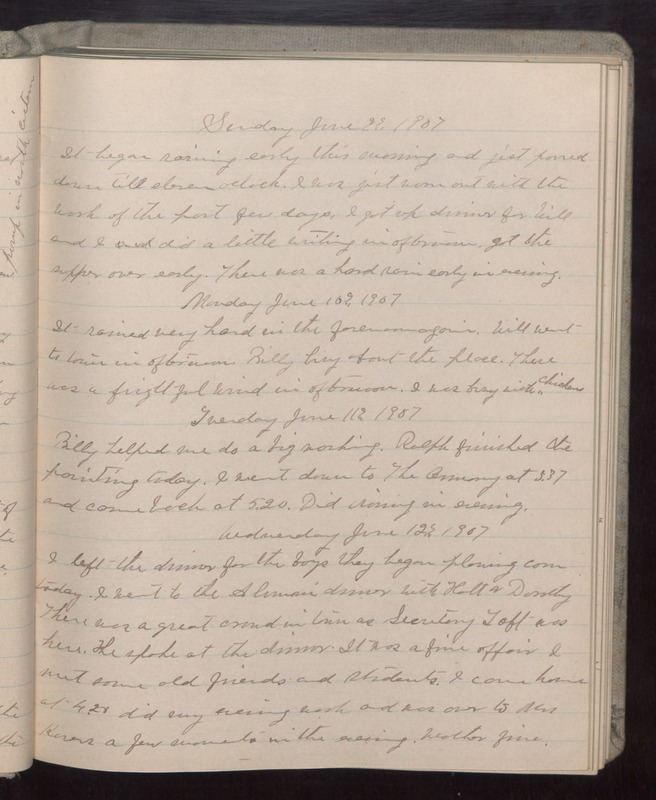 Wednesday June 12 1907 I left the dinner for the boys they began plowing corn today. I went to the [Almain?] dinner with Hatt & Dorothy There was a great crowd in town as Secretary Taft was here. He spoke at the dinner. It was a fine affair I met some old friends and students. I came home at 4.27 did my evening work and was over to Mrs [Kovers?] a few moments in the evening. Weather fine.